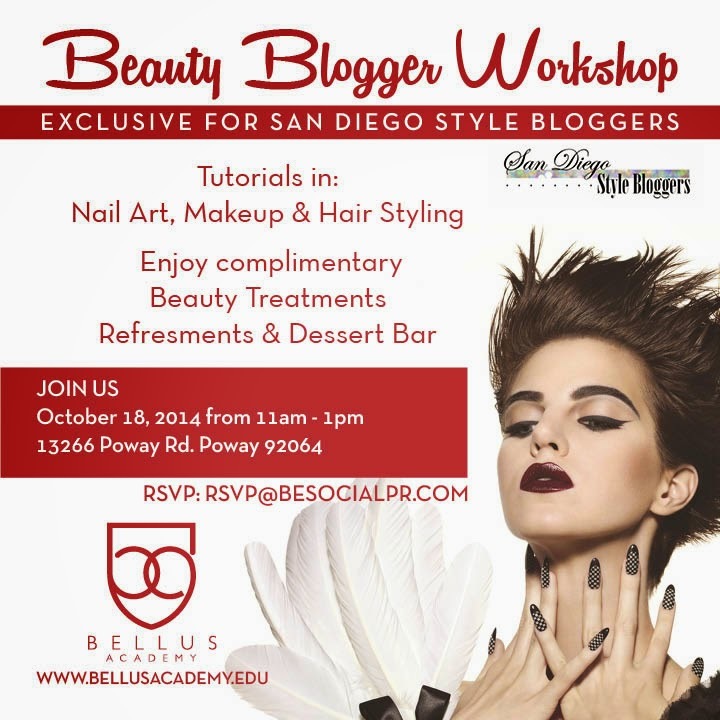 It's that time again for another SD Style Bloggers official meet up! This time Bellus Academy has been so generous in not only hosting us, but giving us Nail Art, Make Up & Hair Styling tutorials!! They will also be giving complimentary beauty treatments accompanied with refreshments & a dessert bar (yum). All of this, (and your presence of course) will make this the perfect Beauty Blogger Workshop! As always our meet ups are FREE--> To attend, simply RSVP to RSVP@BeSocialPR.com to reserve your seat. If this is your first meet up, please don't be shy and come on by! SD Style Bloggers takes pride in welcoming all of the San Diego based bloggers who share in the same passion- blogging! If this is not your first meet up, y'all know these are fun & I can't wait to see you again! Exciting! Looking forward to my first event with the group!